← Evolution of Electric and Hydrogen vehicles – what is the future? 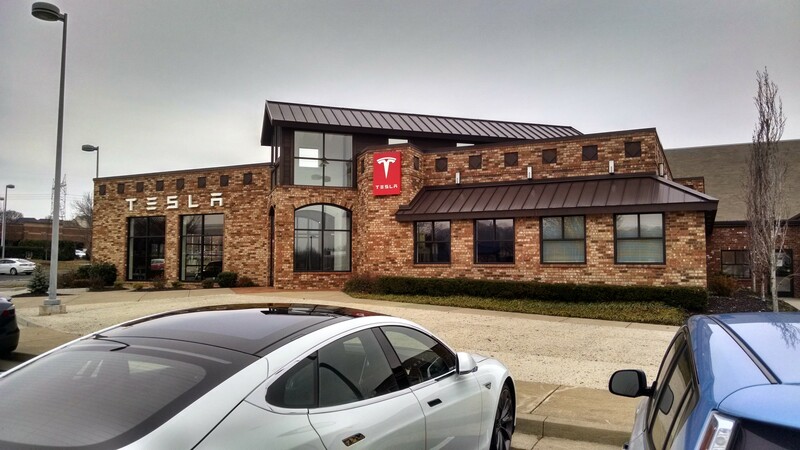 Tesla opened their Nashville Showroom on December 19th 2014 less than 3 miles from Nissan’s North America Headquarters. I went by the showroom to say ‘hi’ and welcome Tesla to Nashville. I got a rather odd ‘Pfffft’ from a staff member when he greeted me and my LEAF along with a comment that I’d brought a LEAF onto their turf. Once inside I was able to sit in a P85 Model S and the staff were attentive without being pushy. Tesla had an employee from Atlanta come to Nashville to help with the test drives, he drove up in a Model S and supercharged at Chattanooga for 40 minutes to complete his journey. I asked about when a Nashville Supercharger would come, but he simply stated the standard company line that by the end of 2015 90% of all households in the US will be within reach of a Supercharger. He wasn’t giving away any information regarding Nashville. I noticed the Model S headroom is less than in a LEAF. Looking at the showroom photo above my LEAF stands a little taller than the Model S next to it. I wasn’t expecting that from a much bigger vehicle. The Model S is clearly longer and wider than a LEAF and I found the front seats to be very comfortable compared to my LEAF. Getting into the rear seats is a bit of a squeeze. There is better headroom compared to a LEAF in the rear but my knees were touching the seat in front as would be the case in my LEAF. I’d be happy enough travelling long distance in the Model S’s front seats, not so much in the rear. Model S portable EVSE and adapters Click image to enlarge. 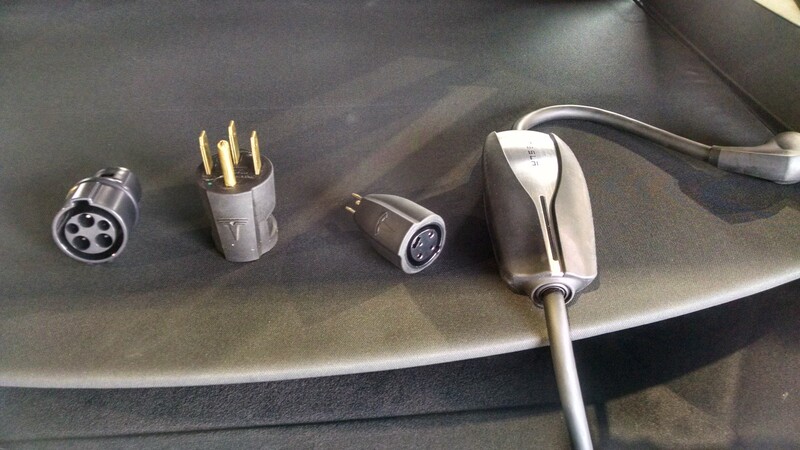 I spent sometime examining the portable EVSE and adapters that come with the Model S. The car on display had three adapters included, an adapter for standard 240v charging stations (J1772), an adapter for 120v outlets and an adapter for 50Amp/240v campsite outlets. I wish Nissan would provide a portable EVSE with adapters as well. I had mine converted for $300 and now have adapters, but the Tesla adapters are very compact and light. 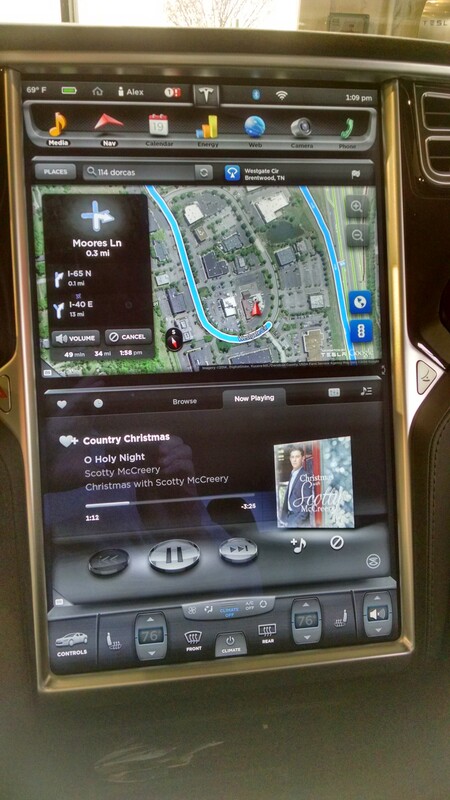 The big feature of the Model S is its large 17″ touchscreen console. I was pleased to see an option to turn ‘creep’ off when the car is on and in gear. A feature that bugs me in the LEAF, I wish Nissan would give drivers this level of customization regarding the car behavior. I was impressed that many of the settings on the touchscreen are also available on the dash instrumentation with controls on the steering wheel. The two worked very well together, whereas on the LEAF its clear the two were designed as separate instruments with minimal integration. The Model S integration is extensive and seamless. I was especially impressed that during navigation a diagram of the next intersection is represented on the dash instruments as well as a center console meaning you only have to look down and not to the center of the car to follow the cars directions. This will be much less of a distraction than looking over to the center of the car. Partly due to this I mount my cell phone on the windscreen of my LEAF so I can easily glance at directions and rarely use the LEAF navigation except to locate charging stations. The other reason I use my cell phone is that Waze is a much better navigation tool than the LEAF navigation. Tesla have mounted 120v outlets at the foot of the light poles in their parking lot, allowing for easy overnight trickle charging of multiple vehicles at this location. I wish more light poles came with this capability, especially at workplaces. This entry was posted in Electric Car, Level 2 EV Charger, Nissan LEAF, Review, SuperCharger, Tesla Model S, Test Drive and tagged Atlanta, Chattanooga, LEAF, Nashville, Nashville Showroom, nissan, Tesla Showroom. Bookmark the permalink.